Do you want to find out more about Teaching English in Vietnam? Fill out the form below and we’ll get back to you! 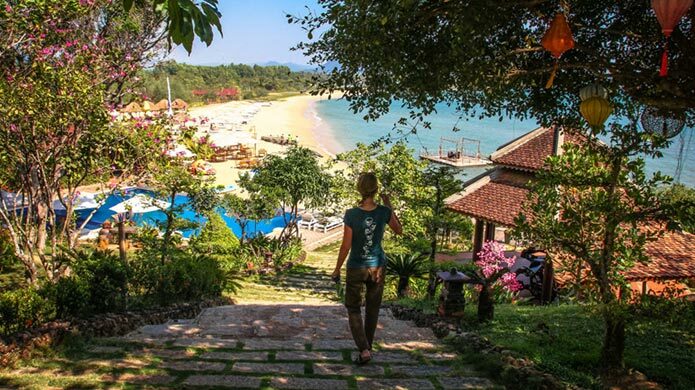 Vietnam is the perfect destination for those looking for a beautiful setting to live in while reaping the benefits of high salaries ($1200 USD – $2000 USD per month) and a significantly low cost of living. Vietnam is also one of the only countries where teachers can advance their career in schools through promotion to management positions. 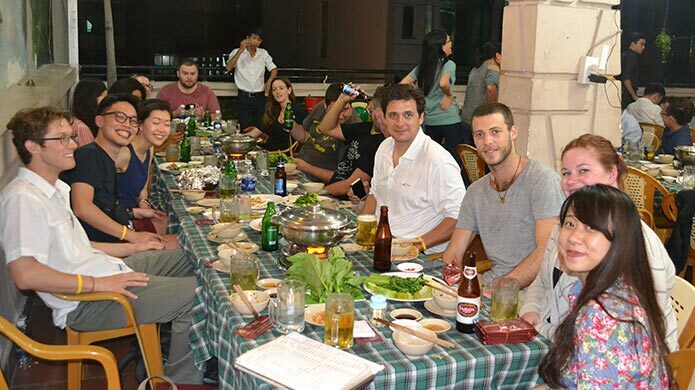 This makes it the ideal program to immerse yourself in Vietnamese culture, it’s natural beauty and unique cuisine while honing your teaching craft and gaining invaluable teaching experience. You’ll have numerous travel opportunities with 20 days vacation plus all public holidays (for 12 month contracts) to explore and weekend getaways from the major cities are cheap, feasible and easy to plan. You will prove the students you teach with a skill that will see them break through the barriers of poverty with endless employment opportunities available to those who can speak and understand the English language. Vietnam is an incredibly beautiful country which is easy to travel around and perfectly situated for traveling to other countries all over Asia. If you are teaching for short contracts, you won’t get a lot of time off during your contract but you’ll be able to travel after you finish teaching. If you are teaching for 1 year, you should get up to 3 weeks leave as well as the holiday over Vietnamese New Year which will be 1 to 2 weeks. This gives you plenty of time to explore Vietnam and the surrounding countries. Weekend getaways from the major cities are cheap, feasible and easy to plan. Chat to us if traveling widely is part of your plan. We’d love to offer advice and suggestions for exciting travel experiences in and around Vietnam. Visit Phu Quoc, the largest of Vietnam’s islands. Justin stayed with a family in Sapa, full of rolling mountains of rice paddies. 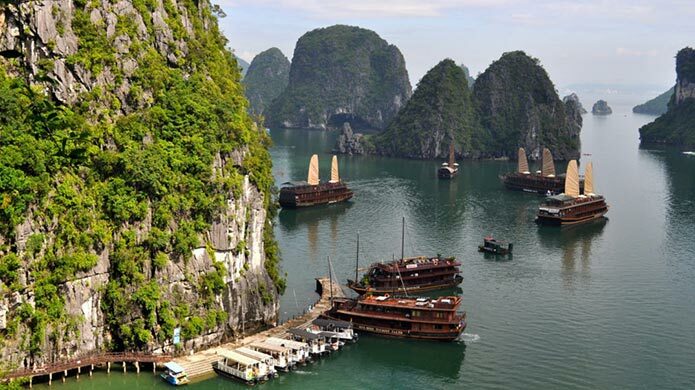 Halong Bay is Vietnam’s premier tourist attraction and an absolute must if you love dramatic scenery. 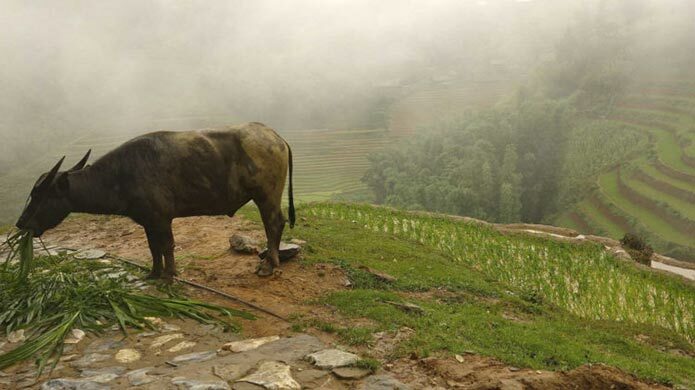 Lao Cai and Sa Pa in far northern Vietnam can be reached by overnight sleeper train and/or bus from Hanoi and are great for scenic vistas and experiencing Vietnam’s many minority cultures. Hue is a wealth of regal looking buildings, especially within the imperial citadel. Just be prepared for some rain though, the city has a notoriously wet climate so bring an umbrella. Want to teach English in Vietnam? It can be scary and intimidating traveling to a foreign country and the complex documentation and requirements can be overwhelming and confusing. We know. We’ve all taught abroad before. Everything explained clearly. We’ll walk you through each step and make sure you’re prepared. We help you plan. From what to pack to what documents to gather when. Guaranteed job placement. We place you in carefully selected and reputable schools in Vietnam. Accredited TESOL and cultural orientation. We provide the essential courses to help you succeed abroad. 24/7 support. Once you arrive in Vietnam we’ve got your back in an emergency or to answer any questions. With TravelBud, you’ll always be talking to someone who has taught or volunteered abroad before, so you’ll get informed, first-hand advice to guide and prepare you for your experience. Do I Qualify To Teach English in Vietnam? You don’t need to have any teaching experience to teach English in Vietnam. How long is the teaching contract for? 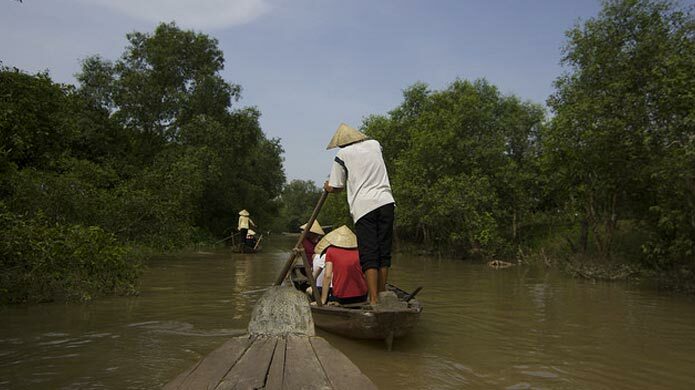 Placements are for as little as 4 months up to 1 year and can be renewed if you’d like to stay in Vietnam for longer. What if I don’t have a TESOL certificate? We offer both in-class and online TESOL courses to prepare you for your adventure abroad. Read about our TESOL courses below to learn more. If you’re unsure about any of your qualifications, chat to us! We’ll answer all your questions and do our best to accommodate you. Many TESOL courses are not accredited and do not provide adequate preparation for teaching. That’s why we highly recommend completing the 120-hour in-class TESOL in Vietnam. It will give you the best possible preparation and ensure that your students get the best education. These courses are tailored specifically to living and working in Vietnam and will give you valuable insight into Vietnamese culture, living arrangements and the specifics of teaching in a Vietnamese classroom. The in-class TESOL course includes lessons on the local language, culture, society and politics. The TESOL Course and orientation takes place over 4 weeks in Ho Chi Minh City or Hanoi, Vietnam and is tailored specifically for native English speakers preparing to teach English in Vietnam. It consists of a 1 week Vietnamese cultural orientation followed by 3 weeks of TESOL theory and practical learning. 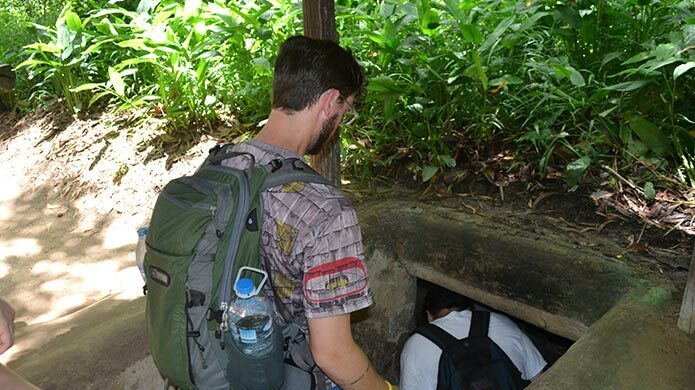 Visit the Cu Chi Tunnels, an elaborate network of tunnels used during the Vietnam war. The in-country excursions are punctuated by in-class language and culture lessons, developed to establish a basic understanding of Vietnamese politics, culture and language. Many of our teachers visit the friends they make during the cultural orientation. 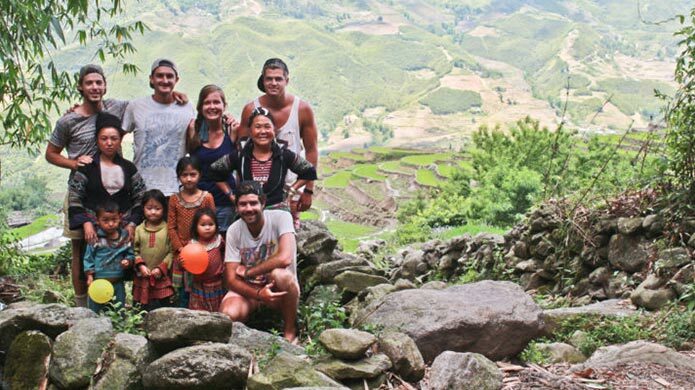 As we place teachers across Vietnam, this becomes valuable as you’re able to visit your friends in different parts of Vietnam and fully experience all that the country has to offer. Learning excursions provide insight into the multiple facets of Vietnamese culture, and allow participants to interact with the locals. 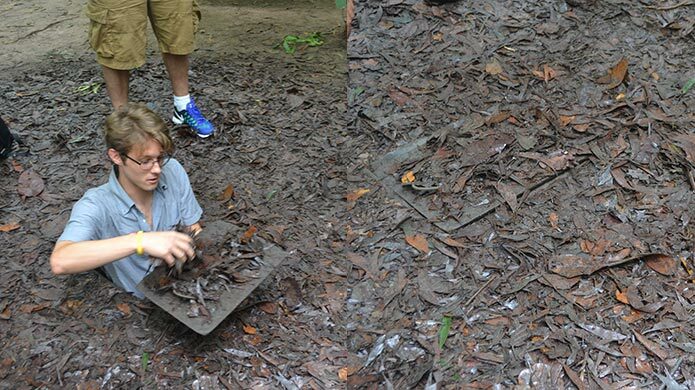 Step inside the Cu Chi Tunnels, an elaborate network of tunnels used during the Vietnam war. Bond with your fellow TESOL classmates and form a network of new friends from all over the world. As an English teacher in Vietnam, you’ll earn $1200 – $1800 per month. This will comfortably cover your living expenses, which are very low, as well as weekend adventures and more long-term travels. Shorter contracts of less than 12 months may pay less, but pay is dependent on hours worked, so if you work more your salary will be greater. The following costs make up the program fee and are payable to TravelBud before you head over to Teach English in Vietnam. Change to your currency. Default prices in US Dollar (USD). Please take note that the amount reflected above is based on the current exchange rate and may fluctuate due to exchange rate volatility on the day of being invoiced. The in-class TESOL courses is tailored specifically to teaching English in Vietnam and will give you valuable insight into Vietnam culture and the specifics of teaching in a Vietnamese classroom. Required to enroll in the program and begin receiving pre-departure support from the TravelBud team. The 120-hour in-class TESOL gives you the best possible preparation and ensures your students get the best education. We also guarantee you a job placement so you can start earning straight away. Guaranteed job placement in a background-checked and credible school. This fee is only to be paid 8 weeks prior to your departure. What is included in the TravelBud enrollment fee? As soon as you pay your deposit, your pre-departure support kicks off. From that moment on, TravelBud will be on call to answer all your questions and provide all the support and guidance you need. Answering your questions to help ease any anxieties you may have regarding your trip. On-the-ground support and personal assistance throughout the duration of your teaching experience. TravelBud’s support managers will also check in with you regularly for the duration of your teaching English in Vietnam experience. Your once-off placement fee guarantees you a lifetime of job placement with TravelBud. If you want to teach somewhere else after your time in Vietnam, we will organise job placement for you – as long as you qualify to teach in that country. Access to online teaching resources such as printable lesson plans and worksheets which will make your job a whole lot easier! There is always a supervisor that teachers can go to for help with their teaching tasks. What is included in the TravelBud Program fee? What are the other costs involved prior to departing? The above tables detail costs you’ll need to pay TravelBud in order to join the program. You’ll also need to budget for various other expenses, not payable to TravelBud, which allow you to legally teach abroad plus the cost of travel to your destination and insurance for your trip. Flight prices vary dependent on where you travel from and when you book. Prices can occasionally exceed this range. We recommend booking 2-3 months in advance or more for the best rates. Travel insurance prices can vary dependent on things like provider, your age, country of origin and duration of your stay. This range is for TravelBud's recommended policies based on stays of 6 months or 1 year. This budget is assuming all of your current documentation is in English, you are in possession of your physical degree and that you hold a valid passport. Our support managers will assist you with booking flights, finding the best insurance for you and advising you on all the documents costs involved. Bear in mind that you will be spending at least 2 months in Vietnam before you receive your first paycheck. You will therefore need to budget enough money to see you through the 1 month TESOL course and your first month of teaching. 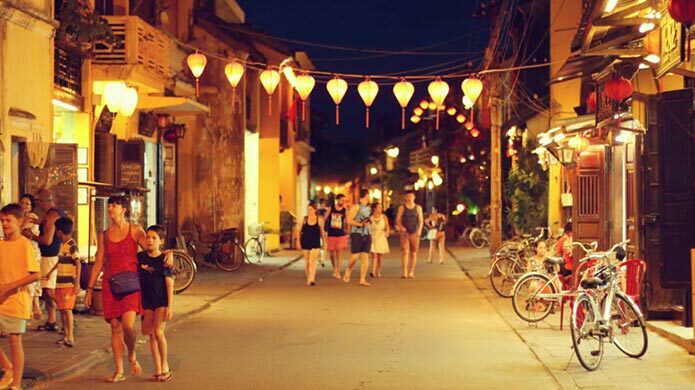 Of course, the amount of money you need depends on your spending habits and Vietnam is generally a cheap place to travel to, so you should be able to manage on a relatively low budget if necessary. In total, we recommend taking at least $1500 with you to start your teaching journey in Vietnam. However, you might find that you need more money to suit your lifestyle or to buffer unexpected expenses. However, you might find that you need more money to suit your lifestyle or to buffer unexpected expenses. Basic supplies will be provided during the course but you may want to get creative and add your own materials, at your own cost. Food, transport, laundry, etc. These costs can vary depending on how tight your budget is. Eating local food and using shared public transport can dramatically reduce your spending. Depending on your needs and interests, these costs can vary. Chat to us for specific advice. During the first week of the course, you will be taken to a local mall where you can make any purchases you might need. We strongly recommend that you take all clothing and toiletries with you, as the availability of specific products is not guaranteed and clothing sizes might be quite different from those back home! Depending on where you are placed, you might travel by van, bus or plane. Our in-country partners will assist you with purchasing your ticket and guide you through everything you need to know. The cost of accommodation will vary depending on where you will be teaching. You will need to pay a deposit with 1 to 2 months rent up front. We realise that moving abroad to teach English in Vietnam is expensive at first, but remember that with TravelBud your teaching job is guaranteed. Once you start earning a salary, your living costs will be comfortably covered and you will be able to save money to travel and enjoy your time teaching English in Vietnam. We understand it’s hard to take this all in. When can I start Teaching English in Vietnam? These dates coincide with the highest demand for teachers by Vietnamese schools and we therefore highly recommend choosing a Vietnam TESOL course. Placements are for 1 semester (4 to 5 months) in public schools or for 4-12 months in private schools and can be renewed if you’d like to stay in Vietnam for more than a year. In the event that the above dates don’t suit your needs, speak to your enrollments coordinator about the option of doing your orientation and TESOL in Thailand where courses happen almost monthly. You’ll then fly over to Vietnam upon completion to start work. These courses are tailored to teaching and living in Thailand, so we recommend you choose one of our Vietnam courses listed above wherever possible. In-depth presentation of not only the surface elements of Vietnamese culture such as food, entertainment and dress, but also the underlying influences that guide peoples’ behaviors. Participants pose for a group photo at a Vietnamese food market. French Colonial style city hall in Ho Chi Minh City. And any questions you might have to help ease any anxieties during the pre-departure process. When you arrive in either Ho Chi Minh City or Hanoi, you’ll be fetched from the airport and taken to the shared accommodation which TravelBud organises for the duration of your Cultural Orientation and TESOL course. Your accommodation will be organised for you. Your teaching job is guaranteed with TravelBud. You’ll head off to your new job as soon as you’ve completed your TESOL course. You have 3 options for contract length: 1 semester (3-4 months) public school, short contract of 4 months minimum or 1 year at private language centres. You will be based at a language centre and travel to multiple public schools to teach. Public school classes usually consist of 40 to 45 students. Teaching resources might be limited at some of the schools but the private language centres where you will be based will be fully stocked with resources. You will be teaching at a private language centre. Your contract is renewable, so you can choose to teach for more than one year. You can expect to teach between 12 and 15 students per class at the private language centres and your typical work day will start at 12pm and end at 8pm. Hours and class size do, however, vary from school to school. Keep in mind that placements do depend on what jobs are available. TravelBud does take your preference into account when placing you in a job. However, these placement do depend on what jobs are available so we cannot guarantee any jobs according to preference. A teacher poses with his students in a Vietnamese classroom. Vietnamese learners enjoy the fun and games of interactive class lessons. A Vietnamese public school classroom environment. Can I be placed with my friend or partner? Yes, we can place you in the same town as your friend or partner. You might be teaching in the same school or in nearby schools, depending on the availability of jobs. What if I am unhappy with my job? Can I be placed somewhere else? If you are unhappy and there are clear reasons why the job is not working out for you, TravelBud will place you in a different job. We have strong relationships with our partner schools and our applicants are generally very happy with their placements. We are also available 24/7 to chat about how things are going and will check in with you throughout your adventure. What is the dress code for teaching? Dress code is smart-casual – collared shirts for men and conservative for women. 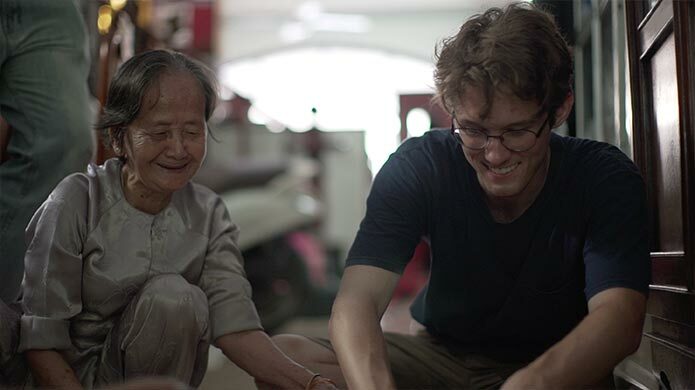 Justin, a videographer from South Africa, at a language institute in Vietnam. Here he is with his young class. What accommodation can I expect to have? Accommodation in Vietnam will vary depending on where you are living and whether you are living alone or sharing with others. It is possible to rent a room in a shared house or apartment at a very reasonable price. Single occupants might expect to pay a bit more but rent is still very affordable. Some of the housing may even including someone who will do laundry and cleaning for a small fee on site, or it is included with the accommodation. Houses are often several stories high with one or two rooms on each floor, several bathrooms, and the kitchen and lounge on the ground floor. Kitchens and bathrooms are modern and well equipped. Where do I stay if I do the In-Class TESOL course in Vietnam? Depending on where you go, you’ll have shared accommodation in hotels in Ho Chi Minh City or Hanoi. Ho Chi Minh hotel where you’ll be based for your TESOL course. Hanoi accommodation is also clean and modern with everything you’ll need for your TESOL course. Rent will vary depending on where you are living, but it is guaranteed to be affordable based on what you will be earning. Will I be living with someone? If you are placed with a friend or partner, we can assist with finding accommodation for you both. If you are living in one of the bigger cities, there is a strong network of foreign teachers and choosing accommodation in a shared house can be an easy, affordable and fun option. Let us know what you need in terms of accommodation and we’ll assist with finding the best living environment for you. We’re available to talk you through the whole process! Why Teach English in Vietnam with TravelBud? Our support managers will assist with all planning, packing, visas, costs, documentation, booking flights and answering any questions you might have. Our in-country partners will be available for the duration of your time in Vietnam. If you need any assistance or advice, or in the event of an emergency, we’ll be on hand! If you’d like to move to another program after teaching in Thailand, we will facilitate this at no cost. Prepares you for your teaching experience in Vietnam and introduces you to Vietnamese history, language, politics and culture. Chat to our enrollment coordinators for more specific details about budgeting. Our enrollment coordinators have all taught abroad and have first-hand insights on our teach abroad destinations and programs. We'll assist you with the additional purchase of your travel insurance via our insurance partners. You’ll have access to a database of lesson plans, worksheets, flashcards and printable materials for your classroom. Moving to another country to live and work is a big step and we realise that safety can be a concern. What do TravelBud staff and teachers say about safety in Vietnam? Vietnam is generally a very safe country to live and travel in. Our teachers (both men and women) report feeling safe and accommodated during the time they lived in Vietnam. The roads can seems quite chaotic at first and it takes a while to get used to the seemingly incomprehensible traffic laws. Once you get used to it, however, you’ll realise that people drive quite slowly in the cities and are very careful on the roads. If you’re on a bike, take it slow and weave with the traffic and you should be just fine. If you’re taking buses intercity, make sure that you’re travelling with a reputable bus company. Chat to us if you need any assistance or suggestions. The police in Vietnam can seem intimidating, especially because of their military attire and history of militant culture. Don’t be put off though! Authorities will be very helpful towards foreigners, as long as you are sticking to the law. Be cautious with eating food that has not been cooked as fresh fruit and vegetables can be washed in tap water which might make you sick. Be alert and keep your valuables in a safe place, especially in a particularly touristy area. How much does it pay to teach English in Vietnam? How much can I earn? In Vietnam teachers are paid hourly. So your monthly salary will depend on how many hours you work. A full time contract requires you to work about 80 hours in the month and will normally pay between $1200 USD – $2000 USD per month. If you want to increase your salary you can easily pick up extra classes at your language centre. Is English spoken in Vietnam? In the major cities most people will have a basic understanding on English. Are teachers in high demand in Vietnam? Why? Teachers are in very high demand in Vietnam. In the past decade, Vietnam has experienced massive economic growth and a booming middle class, which has created a large market for English education. Many Vietnamese parents understand the importance of English education for their children and this has led to a great increase in the amount of language centers and foreign teachers in public schools in Vietnam. In order to attract teachers and meet this demand, schools in Vietnam offer very good wages, especially considering the low cost of living in Vietnam. Do students have to learn English in Vietnam? Almost all students will take English with Vietnamese English teachers for some time in public schools, but most students will not come in contact with a foreign teacher. How long does it take to get a TEFL/TESOL certificate in Vietnam? We have a four week program with one week of cultural orientation and a three week long in-class Vietnam TEFL/TESOL course. Do schools in Vietnam accept Online TEFL/TESOL certificates? If no, Why not? Online TEFL/TESOL certificates are not generally accepted for public school nor for most language centers in Vietnam. This is because most schools in Vietnam do not believe online TEFL/TESOLs provide a high enough standard of training and the private language schools in Vietnam are quite expensive for parents, pay very well, and have higher expectations. There are limited exceptions to this and we consider those on a case-by-case basis. We offer an internationally accredited in-country Vietnam TEFL Course that thoroughly prepares students for teaching English in Vietnam. What are the expected tax deductions from your paycheck? Does is differ from school to school? Teachers are taxed at two different rates in Vietnam. The first rate is 20%, which is the tax rate for those in process of obtaining a work permit and until they are considered a resident. Once teachers have resident status, the typical tax rate will be from 10-14%, depending on the teacher’s salary, Schools will handle all teacher tax matters. Where will I be placed teaching English in Vietnam? We can place teachers in: cities, satellite towns around cities and you can teach Kindergarten, Primary (elementary and middle) or High school. Please review our blog post on placements teaching English in Vietnam which explains placement options in detail. Do schools pay you a fee/portion of my salary? If so, Why? No, TravelBud and our partners DO NOT receive a portion of the teacher’s monthly salary. After teachers are placed at a school, they will sign a contract directly with that school, not an agent or any third party. The school pays the teacher directly. The amount the teacher will see on their contract is their salary, with taxes being the only deductions. What is the big difference between language schools, private schools, government schools and varsity? The two types of schools in Vietnam are language centers and public schools. If teaching at a language center, teachers will work weekday evenings and daytime hours on the weekends, as these are schools students go to outside of their regular schooling. Teachers will have one or two weekdays off a week, as well as a lot of free time during the day on the other weekdays. Class sizes will be smaller, with averages of between 10-15 students. Lessons are typically 1.5 to 2.5 hours long. If teaching in a public school, teachers will work daytime hours during the week, with weekends off. Classes will be shorter averaging around 40 minutes with 30-40 students. In both types of schools, teachers likely have around 20-25 teaching hours per week. Some teachers will also have the opportunity to teach in both public and private school settings as part of their contracts. How long are contracts for Teaching English in Vietnam? Please review the costs section on this page thoroughly. We provide useful breakdowns to help you budget. How many days off do I get? You’ll have numerous travel opportunities with 20 days vacation plus all public holidays (for 12 month contracts) to explore and weekend getaways from the major cities are cheap, feasible and easy to plan. Our support team will provide you with a detailed breakdown of your days off so you can plan your epic adventures! 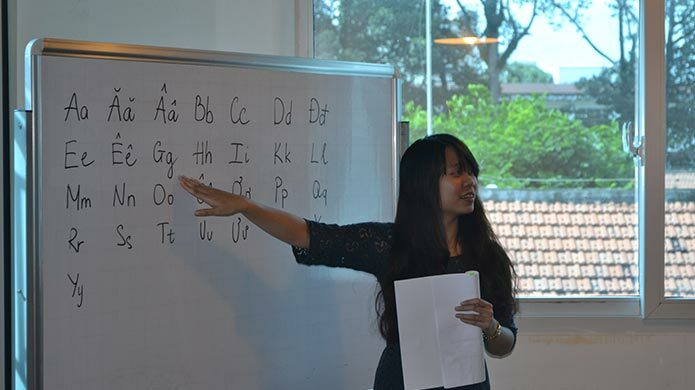 Read our Vietnam blog posts to read about our alumni’s experiences teaching English in Vietnam. What is the main religion in Vietnam? 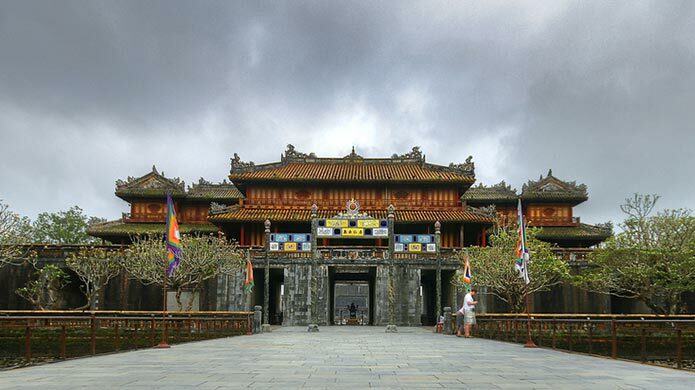 Vietnam is made up of a number of religions with the majority practicing Mahayana Buddhism. Buddhism, Confucianism and Taoism are heavily intertwined. This Wikipedia article has detailed information to review. Will I get picked up from the airport? When you arrive in either Ho Chi Minh City or Hanoi, you’ll be fetched from the airport and taken to the shared accommodation which TravelBud organises for the duration of your Cultural Orientation and TEFL/TESOL course. Naturally I was nervous and worried about moving to South Korea, a country I had just heard of in passing. TravelBud were there for me every step of the way. They responded really fast, and gave me all the information I needed. I liked that they broke things down for me into manageable bits. It can get really overwhelming if you don’t have anyone guiding you through the process. I found the assistance from TravelBud to be excellent. The staff were very helpful and provided me with very valuable information. At no point did I feel that I could not approach TravelBud with any concerns or questions I had. Their availability to help me at any point was much appreciated. Saskia Smuts was especially helpful and provided excellent support and information which helped me to make well informed decisions. Moving to any new country to go work can be terrifying and coming to South Korea is no exception. I was overwhelmed with the process of getting to South Korea until I was made aware of TravelBud. The TravelBud staff guided me every single step of the way and I was exposed to quality and personal service all along the process.